I watch a lot of YouTube. It's the Millennial in me, okay? I am a little old to be in Pewdiepie's audience, though. I used to feel guilty about it, but I thought he was funny. But after WSJ wrote that assassination piece on him - there are parts of it that are verifiably inaccurate - I started to feel less and less guilty. Felix is just a person with two editors making content everyday. How original it can be called remains to be debated, but this is the classic example of how hard work, planning, and forming a community can create success. It's not the American dream - especially since Felix is not American - but it is the Millennial dream. Follow your bliss. But there is a threat to what Felix represents. Pewdiepie is currently the most subscribed to YouTuber, but he won't be much longer. 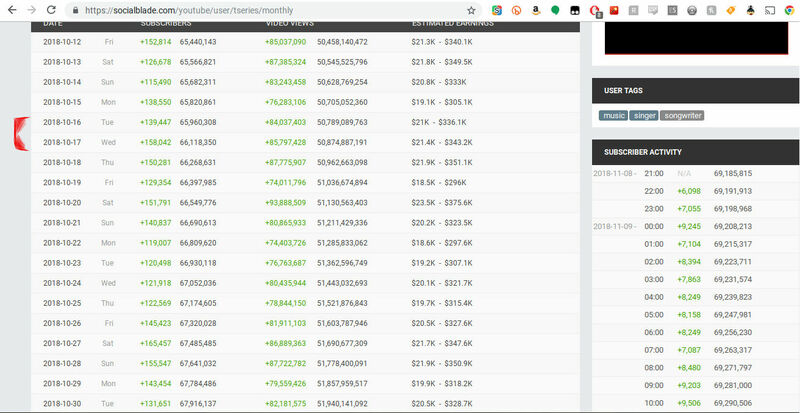 T-Series, an Indian channel that's growing exponentially faster than Pewdiepie, is about to pass them up. It's currently a race to see who will be the first one to 70,000,000 subscribers. So, why is T-Series a threat? Because T-Series is a corporation. It's like the equivalent of Viacom becoming the most subscribed YouTube channel. Once T-Series becomes the most subscribed channel, the You in YouTube won't mean anything. It won't be about creators connecting to their audiences anymore. It will be about which corporations can reign supreme. Of course, Pewdiepie isn't going down without a fight. His nine year old army stands strong with him. See, Felix has even said a long time ago that he doesn't care about being the number one channel and that it probably should be someone else. He has recently amended that, however, to say he doesn't want a corporation to be number one, either. But there's also some controversy involved. On October 16, 2018 - a date I remember because it was my birthday, and the day before I started this blog - YouTube went down for a few hours. It was awful. I had to use my Bluray player like a caveman. But while YouTube was completely down - T-Series was still gaining subscribers. I've seen people post the hourly count of subscribers T-Series gained during the outage, but that was a while ago and I had a harder time finding that information now. But I did look at their monthly views on Social Blade. What I've marked off on the side is the date range where the outage would have happened - because, you know, time zones. How do those work? Anyway, what you can see is somehow, during the date range of the outage, they were, in fact, gaining more subscribers than average. While it might not be the same hourly subscription count that definitely proves something fishy was going on, this does suggest that their subscriber count may not be what it seems. I stand proud as a member of the nine year old army. I do not want the number one subscribed YouTuber to be a corporation. I want to keep the Millennial dream alive. If you haven't, you should subscribe to Pewdiepie. His videos are varied enough you might even find something you like.